Just as spring was setting in and people were heaving a sigh of relief, unseasonal rains lashed many parts of the country towards the end of February, stirring a familiar fear. Most of the states, including Rajasthan, Madhya Pradesh, Telangana, Uttar Pradesh, Maharashtra, Delhi and Gujarat that received heavy rainfall, have reported a high number of swine flu cases this winter; cases of deaths in these states have touched triple digits. Low temperature means that H1N1, the virus that causes swine flu, is likely to thrive in the air for some more time. Going by the wisdom of public health experts, swine flu is as benign as any other seasonal flu, but people are wary of it as they fail to distinguish between the two. And by the time they do, it might be too late for some. Take the case of Kailash Chand, a 40-year-old daily wager from Guja village in Rajasthan’s Jaipur district. Despite cold, cough and mild fever, he avoided going to a doctor for a week and continued to work at a construction site. “We thought he would recover in some time. But his condition kept worsening. He became weaker and could not walk properly,” says Ramavtar, Chand’s nephew. They consulted the village health worker, called the local auxiliary nurse and midwife (ANM), but she did not know about the flu or its treatment. So Ramavtar took Chand to Kotputli town where doctors took three long days to diagnose the ailment. “They said no hospital in Kotputli had the expertise to treat him and referred him to Sawai Man Singh (SMS) hospital,” Ramavtar says. SMS hospital in Jaipur is a super-specialty government hospital in the state. By the time Chand travelled 117 km to reach the hospital, he had developed infection in both the lungs and breathlessness. The doctors at SMS hospital had to immediately admit him in the intensive care unit (ICU). Till the time the magazine went to the press,, Chand’s condition was critical and he was on life-support system (see ‘A long road to treatment’,). 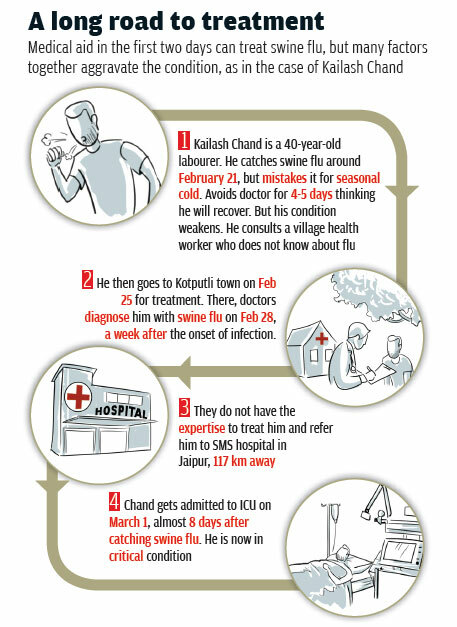 Chand is one of the 5,782 people in Rajasthan affected by swine flu; the state has recorded 286 deaths. Rajasthan is one of the poorest states in India, lagging behind other states not only in economic growth, but also in education and public health. Public health experts blame lack of awareness and poor healthcare infrastructure for the maximum number of swine flu cases in Rajasthan. Similar excuses are also cited for states like Maharashtra and Madhya Pradesh that have equally bad health infrastructure; they have witnessed 1,899 and 1,077 cases respectively. But why are relatively developed states, which have good infrastructure and literacy rates, witnessing such high number of swine flu cases? Take Gujarat. Prime Minister Narendra Modi’s home state, whose model of development has been adopted by many states in India, has witnessed the highest number of swine flu deaths (292) this season and recorded 4,904 cases. Delhi does not fare any better. The national capital has some of the best healthcare facilities and institutes in the country. But with 3,310 cases of swine flu in the past two months and 10 deaths, Delhi has become a panic zone. A sense of fear and confusion is evident from conversations on the street. 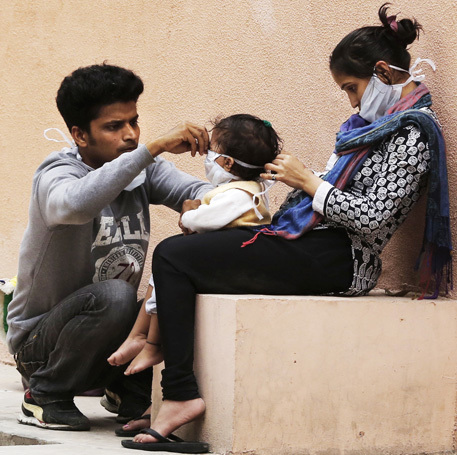 Face masks have become the norm, worn by weary Delhiites as a precautionary measure. An advertisement by the Union Ministry of Health and Family Welfare is being regularly aired on FM radio channels to create awareness about swine flu. The panic is much more pronounced in private hospitals. “Patients sometimes force us to admit them, leave alone testing,” says Jasvinder Paintal, doctor at Indraprastha Apollo Hospitals, a chain of private hospitals. 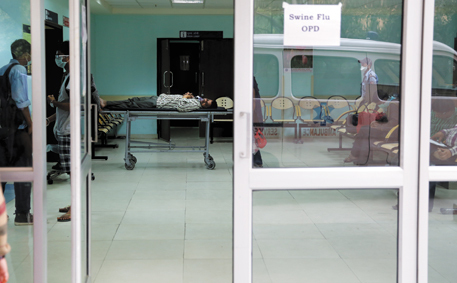 The management has earmarked its Delhi hospital’s first floor for swine flu treatment. There are 35 beds in the ward and 10 in the ICU. Some are even bypassing the doctors and getting themselves tested for the virus. Dr Lal Path Lab, a leading chain of private laboratories in Delhi, has pressed its workforce to collect throat swabs of suspected swine flu patients from home and send them the test results via email. “We do not want our premises to be infected,” says a spokesperson of the laboratory chain. On an average, the lab was collecting nearly 50 samples a day. These are rarely being done on the basis of prescription. Those who cannot afford private labs go to government hospitals to get tested. This creates unnecessary burden on the healthcare system, says Puneet Bedi, senior consultant at Indraprastha Apollo Hospitals. For example, at RML hospital, a staff of 10 doctors and nurses have been assigned to look after swine flu patients. Ideally, they should not attend to more than 200 patients a day, but since January, the out patient department has been flooded with about 500 patients daily, eager to get tested and treated for swine flu. As a result, the doctors have not been able to attend to those patients who have tested positive for H1N1. This is precisely why after the swine flu pandemic in 2009 the government introduced protocols based on guidelines of WHO. Under this, patients who have mild fever, cough, sore throat, body ache, nausea and diarrhoea need to stay at home to avoid spread of infection and be monitored for 48 hours. High-risk groups-children, pregnant women, the elderly and those with low immunity-with the same symptoms but higher fever need to be given medicine oseltamivir (Tamiflu) and confined to home. Those showing all the symptoms in higher degree need immediate hospitalisation. Widespread panic has led to blatant violation of these protocols (see ‘Cashing in on panic’,). Delhi HAS managed to avert a high death toll caused by swine flu, but is grappling with another problem. According to the Government of India's clinical management protocol of pandemic influenza H1N1, not all patients need medical care. Those with mild fever, cough, sore throat, body ache, nausea and diarrhoea do not even require to get themselves tested for the virus. But in a blatant violation of the protocol, many private hospitals recommend tests, medicines and even hospitalisation, says JasvinderPaintal, doctor at Indraprastha Apollo. Physicians charge at least Rs 1,500 per visit. Visiting a patient in ICU is costlier. Private laboratories are also taking advantage of the situation to make money. Till the first week of February, Sequence Lab was charging Rs 3,500 for swine flu test, while Dr Dang's Lab was charging Rs 9,000. On February 18, Director General of Health Services Jagdish Prasad wrote to the Delhi government, asking it to ensure that government-authorised private labs do not overcharge patients. Following this, Delhi capped the cost of swine flu test at Rs 4,500. But pathologists say the cost could have been much lower. Most laboratories in Delhi have imported machines from the US-based Applied Biosystems and use its reagent kit; the cost of the test comes to nearly Rs 1,900, says a pathologist of Ram Manohar Lohia hospital, nodal government hospital for swine flu in Delhi. Director of Genome Diagnostics Pradeep Singhal says if indigenous technology is used, the cost can be reduced further. "We produced a kit in 2009, which worked on multiple machines and the test would not cost over Rs 800," he says. Though the kit was validated by the Sanjay Gandhi Post Graduate Institute of Medical Sciences, Lucknow, in 2009, it is yet to receive manufacturing licence from the Drugs Controller General of India. Singhal alleges that a lobby pushing the purchase of imported machines and kits is the reason indigenous kits are not being promoted. This season, even though swine flu has not been declared an epidemic in India, its spread has been similar to that of an epidemic. 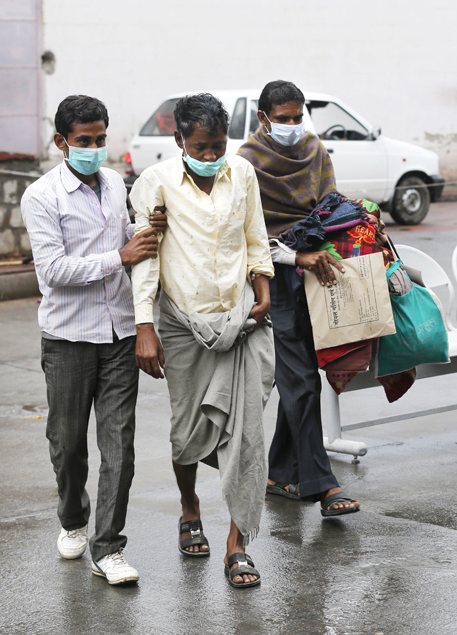 In May 2009, when swine flu first hit the country, the number of cases till December was 27,236, with 981 deaths. The situation this year has been far more severe. In just two months, 22,240 cases and 1,198 deaths have been reported (see ‘Back after a lull’,). The urgency to bring the situation under control was evident from the worried look on the faces of all MPs in Parliament on February 27. A day before the new National Democratic Alliance government presented its first Union Budget, swine flu was the most dominant issue during the question hour. Queries were usual: how does swine flu spread; what is the government’s plan of action; do we have enough laboratories for diagnosis? People are asking these questions not only in India, but in other countries as well. Since January this year, H1N1 has manifested itself globally, particularly in northern Africa and West Asia, including Jordan, Morocco and Tunisia. H1N1 is not new. The world first came to know about it in 1918, when it killed over 50 million people worldwide and infected another 500 million (see ‘Worrying time’,). But that was the pre-antiviral era. In the past century, medical science has made tremendous progress. Following the swine flu pandemic in 2009, scientists developed medicines and vaccines to fight the virus. Moreover, swine flu is not an efficient killer. Though it poses death risk only to high-risk groups and those suffering from chronic illnesses, such as diabetes and heart diseases, lives can be saved with proper medical care. What, then, could be the reason for the exponential increase in the number of swine flu cases and deaths in India? Public health experts blame the current outbreak on decades of failure to invest adequately in basic health services and infrastructure. Consider Rajasthan, the state with the second-highest swine flu fatality in the country. Only 10 hospitals are equipped to treat swine flu patients and all of them are located in cities. In the past two months, SMS hospital alone received 1,260 cases of H1N1 flu from across the state and recorded 85 deaths, out of which 46 were from outside Jaipur. Many had come from as far off as Bikaner (338 km from Jaipur), Jhunjhunu (170 km), Alwar (159 km) and Tonk (106 km). “Treatment is effective when provided within first two days of onset of symptoms. But patients came to us five to seven days later,” says Ajit Singh, nodal officer, swine flu, SMS Hospital. Unlike in 2009, this time health authorities had enough stock of Tamiflu. Singh says many patients who died at SMS hospital could have been treated in their home town as the government has made Tamiflu available at primary and community health centres. Not all health workers, like ANMs and ASHAs (accredited social and health activists), are trained to identify swine flu patients and monitor them, says Rajib Dasgupta, faculty, Centre for Social Medicine and Community Health, Jawaharlal Nehru University (JNU) in Delhi. Kiran Soni, an ANM in Bagru village near Jaipur, did attend a training programme on swine flu. But she did not realise she had contracted the disease until she was diagnosed with the virus. “Till late January, even doctors in the state did not know that there is a spike in swine flu cases,” says Singh. As doctors kept referring their patients to bigger hospitals or those in cities, it contributed to the death toll. First, families with financial constraints do not take patients out of their native place, increasing the probability of deaths. Second, in case of contagious diseases like swine flu, high mobility of patients can result in faster spread of the infection. The current outbreak also points to crucial gaps in the understanding of H1N1, even though it has resurfaced in the country every year since 2009. Usually, following a pandemic, people develop resistance to the virus. Wan Yang, associate research scientist, Department of Environmental Health Sciences, Columbia University, US, explains that going by that logic, those who were exposed to H1N1 virus in 2009 should have become immune to it and the virulence of H1N1 should have reduced to that of a seasonal flu. But that does not seem to be the case. “The currentfatality risk of swine flu epidemic in India appears much higher than seasonal flu in the US,” Yang says. He suggests conducting more research to understand the disease-causing capacity of the infecting strain. Rafi Ahmed, director of Emory Vaccine Centre in Atlanta, US, and advisor to the Indian government’s department of biotechnology, warns in the media that if there is a different H1N1 virus being circulated in India, it may have global implications. Researchers Kannan Tharakaraman and Ram Sasisekharan at the Massachusetts Institute of Technology, US, compared proteins important for virulence and transmissibility in the 2009 and 2014 swine flu epidemics. They found that the H1N1 flu virus that circulated in India in 2014 was distinct from the one that caused the flu in 2009. The findings are published in the March 11 issue of the journal Cell Host & Microbe. H1N1 IS not the only virus that has taken the world hostage. Every year, as the temperatures dip and the air becomes dry, new strains of flu viruses emerge. The viruses that emerge with slight changes only cause seasonal flu. Since they have been circulating in the air for quite some time, most people are immune to them and medicines are readily available to tackle outbreaks they cause. There are others that emerge as “novel strains” and can have the ability to spread more quickly. They do not encounter the “firewall” of protection from pre-existing immunity in a person. Since no medicine is available to tackle them, a large section of the population is susceptible to it, resulting in pandemics. According to WHO, 5-10 per cent of adults and 20-30 per cent of children are infected by one form of flu or the other every year. 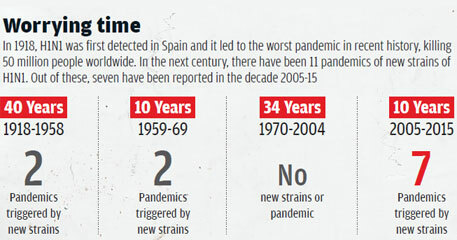 Of late, more number of “novel strains” are causing epidemics. Every year, these epidemics result in three to five million cases of severe illness, and 250,000-500,000 deaths worldwide. In a report in February, WHO states that an influenza pandemic is the most global of infectious disease events currently known. Although we know the general mechanism by which new influenza viruses emerge, our basic knowledge of how these viruses acquire pandemic potential is rudimentary. So far, all we know is that at least 18 HA (haemagluttinin) and 11 NA (neuramin- idase) subtypes of viruses are circulating in the air, which can constantly reinvent themselves by exchanging genetic material. This process appears to be happening at an accelerated pace. Most of these novel strains are being churned out by animals and birds. Since the start of 2014, the World Organization for Animal Health, an inter-governmental body, has been notified of 41 outbreaks in birds involving seven different viruses in 20 countries in Africa, the Americas, Asia, Australia, Europe and West Asia. Climatic conditions are exacerbating the problem. A study published in Proceedings of the National Academy of Sciences in 2013 shows that the four recent human influenza pandemics—reported in 1918, 1957, 1968 and 2009—were first identified in boreal spring or summer and were preceded by La Niña conditions in the equatorial Pacific. Changes in the phase of the El Niño-Southern Oscillation have been shown to alter the migration, fitness and mixing of migratory birds with domestic animals. Thus, La Niña conditions bring divergent subtypes of flu virus together, leading to generation of novel strains. Another study published in January 2013 issue of PLoS Currents suggests that warmer-than-average winters tend to lead to early and severe influenza seasons. In 2012-13, the influenza season had an unusually early and severe start in the US. An analysis of climate and past US influenza epidemic seasons indicated that warm winters tend to be followed by severe epidemics. “Fewer people are infected with influenza during warm winters, thereby leaving an unnaturally large fraction of individuals susceptible to influenza in the next season. This can lead to early and severe epidemics,” say the researchers. In the event of continued global warming, warm winters such as that of 2011-12 are expected to occur more frequently, they warn. Global authorities are well aware of the situation but are far from tackling it. Vaccination is said to be one of the first steps towards preparing for an epidemic. To figure out which specific strains to target, over 100 countries study influenza trends and collaborate with WHO. Usually, they select three or four out of hundreds. Then, based on forecasts and a bit of luck, each country decides which strains to include in the next vaccination. But vaccines have a problem. Since the 2004-05 flu season, US researchers estimate that the effectiveness of vaccines has reduced to 10-60 per cent. This could be because the genetic make-up and antigenic properties (proteins that activate the immune system) of viruses are changing. For example, since February 2014, the genetic make-up and antigenic properties of the H3N2 Virus circulating in North America and Europe has changed. As a result, the effectiveness of the current seasonal vaccine in reducing influenza-related illnesses was only 23 per cent in the US. In January this year, the Indian Medical Association mentioned in a press release that current seasonal influenza vaccines are not expected to provide protection against human infection with avian or swine influenza viruses. This calls for a need to develop more potent vaccines and shorten the production time. During a severe pandemic, many lives are lost in the three to four months that are needed to produce vaccines. Since current seasonal vaccines are ineffective against novel pandemic strains, recent efforts have focused on development of broadly protective or universal influenza virus vaccines that can provide immunity against seasonal flu as well as potential pandemic virus. So, the best way is to prevent major outbreaks of influenza. And this requires understanding flu viruses better. For instance, in August 2014 WHO introduced guidelines for prevention and control of influenza-like illnesses, suggesting that patients should be kept in isolation. However, the specific duration of infectious period for many types of flu, such as swine flu, is unknown. So there is no consensus on how long a patient should be kept in isolation. Researchers of Columbia University’s Mailman School of Public health are working on the prediction of influenza epidemics. “We do real-time forecasts for over 100 cities in the US. In the future, we would like to expand this effort to other regions around the world, including India,” says Yang. Forecasts, if reliable, would help public health sectors devise effective intervention measures to prevent the spread of the flu through efficient allocation of resources such as vaccines and antivirals, and better education of the public, he adds. Rajib Dasgupta of JNU says effective communication is an important tool for reducing the impact of spread of infectious diseases, like the current spread of swine flu. “Only messages about the spread of an infectious disease result in panic. So the government needs to actively engage with the affected population. This can be done by communication specialists who can design campaigns to tackle the panic, and ensure that no critical case is ignored. Unfortunately, India’s public health system does not involve communication specialists,” says Dasgupta. Conditioned by a nervous watch over the lethal H5N1 bird-flu virus in humans in 2003 and then the appearance of H1N1 virus in 2009, scientists are now alert and prepared. But they are more scared than ever. As the virus keeps mutating and evolving, the worst may still be out there. A Thoroughly written article on the subject. Great Effort. Congratulations for highlighting the problem with suggesting effective solutions.